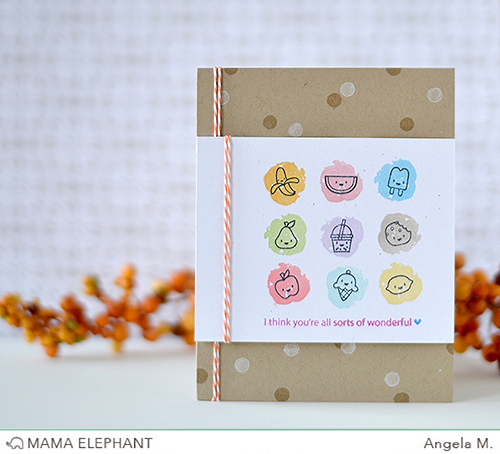 We've got two tremendously cute cards designed by Angela to introduce Little Edibles today. 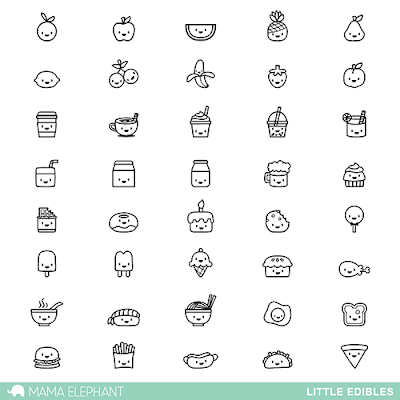 I mean, how incredibly cute are these little food images? You can so many in this one stamp set and they are perfect for so many uses! 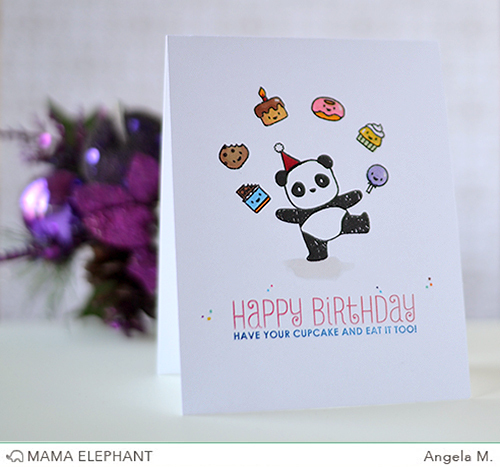 Look what Angela did her using the panda from Pandamonium... juggling food! Super cute! 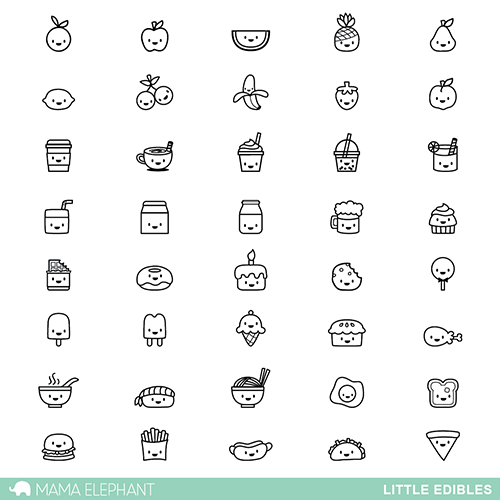 Angela used the little circular brush strokes from Brush Strokes for the kraft background and used the bigger strokes for a splash of color behind the little edibles icons. I really love what she did here! Because the stamps are so many, yet detailed, they are perfect for planners as well! I wanted to showcase some samples using planners but I just received a 2016 planner, lol! Is it too soon to fill it 2 months ahead? I hope to share some planner pages with you soon! So many uses for these, and all calorie free! these are darling. I can see so many used for them. The bear juggling them is just one of many. thanks for sharing a great card and for releasing a fun stamp set. Oh, these are CUUUTE!! LOVE. Perfect compliments to many of your stamp sets!! So fun! Oh, these are sooo cute! Love the juggling panda, but there are also so many other ME characters that can have fun playing with it, or eating it, hihi. Very nice idea, really adorable! This one is a true musthave! oh gosh, these are super duper adorable!!!! Gotta add to my list! There are so many great uses for these adorable little edibles. They are so adorable! I also love what you did with the cards. I love them! I just love the reindeer set! Gosh, the reindeer for reindeer games are just so cute! I am crazy about the reindeer set and the minis, and like all of them!!! I adore the reindeer games! The dies that go with the stamps make the perfect set! I am in love with Reindeer Games!